Special Alert: Press Materials Regarding Rick’s Run for the Amtrak Board of Directors Now Available. Click Here. Since the Amtrak Board of Directors has chosen, to a man, to ignore me (Rick Booth) since early January regarding the planned February monthly pass fare hike, I have sent a final request to stop the increase to Mr. David Hughes, the acting president of Amtrak. If he will not or cannot postpone or back down the increase, I will do my best to take Amtrak to court and hang it out to dry in the press. Are you a lawyer who would like to fight for truth, justice, and 2,000 good, hard-working Americans who have been severely negligently harmed by Amtrak? Do you know a lawyer, firm, or public-spirited agency that would like to take on such a case? I have tons of evidence and information to build a very powerful case for you which should play well both in the courts and in the press. Please contact me at rick@savecornwellsheights.com. 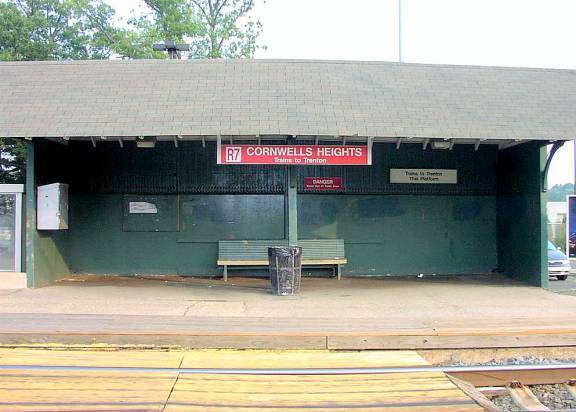 On Thursday, February 16th, it is Amtrak’s stated intention to raise the price of monthly passes between Cornwells Heights and New York City to $882 from the current $719, up $383 from $499 a year ago at this time, a 77% one-year increase. Central Philadelphians will have it even worse, paying $1008 each month. Most will have to earn $9,373 more this year than last to cover just the increase in the fare. The original announcement of Amtrak’s intent to raise fares in February was made in September, but regrettably, Amtrak has not warned new commuters buying monthly passes since then that the increase was coming. At 1-800-USA-RAIL, in fact, Amtrak’s agents still frequently say they know nothing about it. If you’re going to buy a March monthly pass, by all means try to do so no later than Wednesday of next week in order to save $163. If you can afford it, you can also buy passes for April and May at the same time for the same price, but none for the months beyond that. At least that’s a potential savings of $489. At the beginning of January, I (Rick Booth) sent every current member of the Amtrak Board of Directors a packet with 35 pages of documentation explaining my opposition to the February fare increase and presenting evidence of the devastating effects it will likely have on job commuters, considering that many have already abandoned the Amtrak commute after Amtrak hit us with the October portion of the increase from $555 to $719. I asked to meet and talk with each member of the Board individually. None have so much as spoken to me even by phone, and none have replied in writing. The Transportation Department’s representative delegated a lower level lawyer to try to get me to go away. And the Chairman’s secretary, though optimistic that I could speak with him the first time I called his office, informed me the next day that there were no openings on his schedule… ever. Since I can’t get the attention of the Board, I’ve decided to run for it. There are three empty Board spots out of a total of seven right now, and I will be happy to fill one of them. It only takes one vote, the President’s, to win. I’m qualified, and I’m serious. The fight for an affordable way to cross the Delaware will continue. On Tuesday evening, I went online on the President’s website and applied for the job. It took a little longer than expected, because Amtrak is misspelled “Amtrack” in the departmental listings, so I couldn’t find it by simple text search. I sent him a 2-page résumé, a 22-plank platform statement, and an 8-page cover letter. You can see them all online at www.savecornwellsheights.com . The only way I’m likely to get the nod, though, is if a big enough press firestorm gets started. I’ll be glad to give the press all the fuel I can, but I would appreciate any kind references to my website that others can send in to the major media outlets. There’s nothing like an old train movie for great visuals, quotes, and paraphrases. Amtrak is weak and vulnerable. We commuters now have the advantage of surprise and of being right. Let’s take it back! Now, see, there are just four Board members. Mr. Jeffrey Rosen provides the eyes and ears for the words and deeds of Mr. Mineta, conceptualized as a kind of modern minotaur: Jeffman Roseta. These are the men who, on September 22, 2005, either directly ordered – or else failed to countermand – the raising of Amtrak commuter monthly pass fares by almost 70%, a controversial measure that Amtrak first announced on September 9th, then backtracked away from on September 15th due to public and congressional outcry, and finally reinstituted under a smoke screen of PR spin on September 27th, three business days after the fateful Board meeting. The controversy of the fare increase had made national headlines prior to the Board meeting, so it’s not as if it wasn’t worth discussing that day. What happened? We, the dwindling ranks of the Pennsylvania commuters, deserve to know. Please read on. Do you know how much more salary we the commuters will need to earn to cover just the cost of the increase in fare since this time a year ago? If you live in Philadelphia and commute to New York, as most of Amtrak’s Pennsylvania commuters do, and pay for your tickets with “after-tax dollars” as most commuters do, then you’re probably paying 43.8% tax on the last few thousand or tens of thousands of dollars of income you earn. (25% federal, 6.2% FICA, 6.85% NY State, 1.45% Medicare, and 4.30% Philadelphia wage tax = 43.8% tax.) This means you have to “earn” $1.78 to take home a dollar to put in your piggy bank for Amtrak tickets. In the past year, Amtrak has increased the after-tax cost of commuting from Philadelphia to New York by $5,268 (once the impending final February increase goes through next month). That means you’ll need to increase your income by $9,373 this coming year just to tread water. Amtrak, our federally-chartered National Railroad Passenger Corporation, decided to give Philadelphians who commute to New York what amounts to a $9,373 pay cut, making it cheaper, as one Philadelphia correspondent wrote me about his decisions since then, to buy a brand new Camry and drive 100 miles round trip to New Jersey every day to take a Transit train out of Hamilton at a monthly pass price that is less than a quarter of what Amtrak will soon charge Philadelphians. That financial “win” even includes the cost of car payments, and after a few years, those go away and you get to keep the car as a bonus! Now, not that I want to mess with Texas or anything, but for the same $12,096 per year that Mr. Laney wants a single Philadelphia commuter to pay to get to his or her job in New York City, 91 miles away, 30 job commuters in the greater Dallas-Fort Worth area can ride to work and weekend recreation on all the buses and trains they want for a year. Since Mr. Laney helped build that system, I’d like to find out which of Texas’ really good transportation ideas weren’t able to make the trip to the East Coast. Quite seriously, they’re doing something very right down there in Texas, and I, for one, bet I could learn something from him. Amtrak’s monthly pass commuters make up an almost insignificant part of Amtrak’s revenue, about 0.5% of what it takes to run the railroad. The September fare increase (actually instituted in two phases in October and February) has already driven enough commuters off of Amtrak to reduce its revenue gain from the increase to just about $0, and maybe even a revenue loss. The real point of the increase has to do with the secondary headline in the original fare increase announcement, “Reserved Service Expands”. Amtrak doesn’t want us on its trains anymore because it switched to an “all reserved” system the same day it wanted to hit commuters with the fare increase (which is no coincidence). Since monthly pass riders can still hop on any train they like without a reservation, that means Amtrak could sometimes end up apologizing to some “reserved seat” ticket holders for standing room only (SRO) conditions. We commuters have been paying the marginal cost of our own carriage to and from work for years. We were never carried under a subsidy umbrella, and Amtrak has never lost a dime on us. Amtrak doesn’t want our money. It wants our a**es – off the trains. Rather than figure out a way to incorporate a simple commuter credit card swipe on the day of travel into their ticket machine system – so that they could issue real reserved seats to commuters and avoid SRO conditions – it just seemed so much easier to destroy the commuters than to accommodate them and continue to take their money. They lucked into a hurricane and covered it all with a lie. On Thursday, January 5th, I overnighted a polite request to Mr. David Laney to meet with me in person to discuss the possibility of canceling the planned February fare increase and perhaps even doing a rollback of some of the October increase as well. I sent him lots of supporting materials and reasoned arguments for getting Amtrak to do the right thing. I offered to meet him anywhere in the U.S. at my own expense. I’ll let you know how he responds. On Friday, January 6th, I sent similar offers by Priority Mail to Messrs. Hall, Sosa, Rosen, and Mineta. I’ll let you know how they respond, too. Amtrak has behaved disgracefully towards its most loyal, most dependent, most vulnerable riders. In the process, it has forgotten its moral obligations to the two thousand who once trusted it with their careers and the support of their families. It has forgotten the little people and gotten its head stuck in a Disney ride for rich folks called Acela. It has forgotten why it exists. Shortly before the Board fired Amtrak’s president, Mr. David Gunn, I asked him what he thinks the Northeast Corridor really needs now, and he told me he needed another tunnel under the Hudson and more track laid from there to Newark so that the two existing Hudson River train tunnels that were built in 1910 don’t strangle the whole system’s capacity. With the exception of the dedicated short-distance PATH tubes, it’s been about a hundred years since anyone has thought to build another lower Hudson train crossing. I thought about it and promised Mr. Gunn I’d do what I can to get him another tunnel or two, and more track to Newark. I’m still working on it. Ordinarily, I would have taken the matter of the fare increase back to Mr. Gunn, but the Amtrak Board fired him on November 11th. The issue that brought about the firing, as best I understand it from the four hours of C-SPAN coverage of the House Rail Committee’s hearing that I watched, is this: David Gunn believed that splitting off the Northeast Corridor as an operating subsidiary would be a horrendous mistake on the path towards rail privatization and interstate chaos. He viewed it as a form of railroad suicide. The Board ordered him, in effect, to not only draw up a provisional suicide note (a plan for the split), but also to hand them a gun along with it (in the form of papers ready to sign to make the split happen). Messrs. Hall and Sosa, though invited to the hearing, were absent without explanation, so Mr. Laney was left to explain that no decision has yet been made about whether or not to actually make the split happen. All he was asking for was a suicide note and a loaded gun. When Mr. Gunn (pun inevitable) refused to hand him the gun, Mr. Laney requested Mr. Gunn’s resignation. And in a truly dramatic, Hollywood-esque act of personal honor, Mr. Gunn refused to resign and told the Board they would have to fire him. As I see it, I believe he did so because he felt that to do otherwise, he would have Amtrak’s blood on his hands. I don’t pretend to personally know enough to judge whether or not a Northeast Corridor split, with or without privatization and state control, is the best thing for this country. But I do know that, like Mr. Gunn, I have a big disagreement with the Board at this time, and I don’t really trust them with the Corridor yet. But unlike Mr. Gunn, the Board can’t fire me, so from my point of view, I’ve got them pretty much surrounded. I’m fighting for the commuter cause because I have the will and the knowledge and the means to do it – and so that someday when I answer to my own grandchildren, I won’t have to feel the grit of Amtrak’s crusting blood on my own hands either. There’s plenty more that could be said right here, right now, but I’d rather not burn any bridges with the Board of Directors this week. I have no intention of playing the “Roger and Me” game and jumping out of bushes at them. They are invited to speak with me freely and of their free will. We’ll see if they do. I have no intention of “firing” when I see the whites of their eyes. In my experience, when I get close enough to see not just the whites but the telltale iris and pupils of a man’s eyes, and speak with him, I find a good person who has as much right to walk the earth (or ride the trains) as I do. It doesn’t mean we’ll agree, but it does mean we’ll each understand more, and that’s a step in the right direction. Good men can still agree, if necessary, to disagree and part with respect. As part of my Internet wing of persuasive efforts, I put a nice softball starter page up for the Board at www.understandingamtrak.com on Christmas Eve and plan to put up a few more non-attack pages in the very near future. I really would like to explain Amtrak better. I’d really like to come to understand it much better myself, so I can explain it better on the new website. I’d like to help fix Amtrak, because its soul is hurting bad, and there are tunnels to build, track to lay, and miles to go before we sleep.